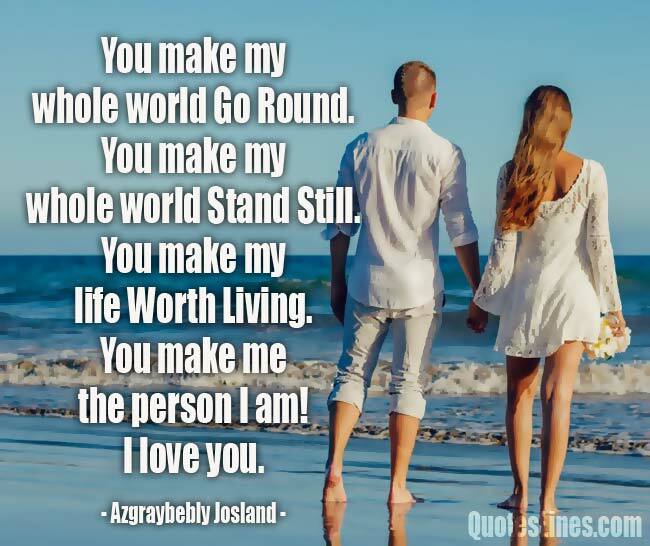 You Make Me Happy Quotes : Life feels complete and living is awesome when you have a loving partner beside you. Really, a caring and loving partner fulfill the relationship with charms and happiness. But a little bit appreciation and saying thanks to your loved one for making you happy is much needed. Our team compiled the best quotes and some romantic lines by which you can easily say to your partner that you make me happy. Browse to get the most appealing you make me happy quotes from our post and just send to your sweetheart. Here you will find, you make me happy quotes for your girlfriend, boyfriend, husband, and wife. Below they are presented in various sections, just choose your sweet one from them. 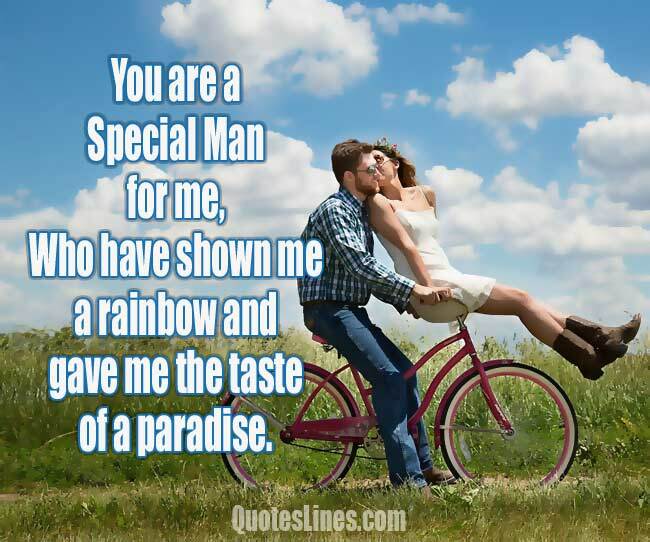 You are a special man for me, who have shown me a rainbow and gave me the taste of a paradise. You don’t need to have the perfect husband in order to have the perfect marriage. You only need to be right for each other to achieve the kind of marriage that will make the both of you happy. Even when you are a thousand miles away from me, just thoughts of you make me happy. I don’t mind when our conversations get a little bit boring and we run out of things to say, just having you is enough to make me happy. You make me happy, you make me feel that I am perfectly fine the way I am and I love it, truly. You make me happy just by looking at me, just by smiling at me and I know that I am caught. You make me happy, and that is enough for me, good enough to give you my heart, my dear. You make me happy, even when you’re awful, I would rather be with you, even the you that you seem to think is diminished, than with anyone else in the world. When you came into my life, there is now no reason for my fear. Thank you for making me Happy and feel secure all the time. You make me happy even when the sky is too angry that it pours down so hard and drowns us. You are the queen of my heart. Your wish is my command and always will be. Thank you for making me happy! You changed my life forever. I now smile for no reason. You make me feel special and valuable. You Speak to my heart like you know exactly what I’m thinking. I’m so lucky to have you as a part of my life. You make me happy and because of that, I want to kiss you and hug you tight and never let go. If you can make me happy, my heart is yours! I think there’s nothing more attractive than someone who doesn’t take themselves too seriously. I want to tell you with my last breath that I have always loved you. Only you, you’re the only thing I’ll see forever. In my eyes, in my words and in everything I do. You make me happier than I ever thought I could be and if you let me, I will spend the rest of my life trying to make you feel the same way. I appreciate your openness and honesty, behind your beautiful appearance, there are a wonderful loving heart and a kind soul. I won the lottery when I met you! The smile on my face is all because of you and I have to tell you that you make me happy dear. I want to give you happiness and joy in return. You fill me with love and I have so much to share with you. You pass through my heart and mind every second of my day. Actions speak louder than words, and a smile says, I like you. You make me happy. I am glad to see you. You make me happy because you dare to try you risk it all and that is all that actually matters. Thank you for making me happy! You make me happy, You make me whole, You take the pain away. I’m so in love with you. A happy ever after is just waiting for me to grab it and you handed it to me with both hands. Thank you for making me happy! The only sunshine I enjoy is you. Even when it is raining and the sky is grey I have my sun. Will you ever find out how much I love you? Please do not hide under the cloud, my love! Before I met you I never knew what it was like to look at someone and smile for no reason. Thank you for making me happy! You are the one that makes my life worth living for and all that I can give to you is my thanks. Nothing could make your partner happy and feel special as your appreciation or offered love. Yes, she/he deserve some sweet words and loving quotes from you every day. Share these you make me happy quotes with your precious one who filled your life with happiness, love and smile.